I am cold and alone inside the cave. Sitting there at 6m I'm slowly loosing all feeling. I am so cold that it hurts. I am desperately craving comfort. To stay put is a mental struggle. It is tempting to shoot up to the surface, to sunlight, to warmth. I know I can't. I know that I have to stay. I know I am stuck in a self-imposed jail cell. I might be wretched and miserable but escape is not an option. The seconds of the clock count down. The more often I look down at the computer, the more frequently I am disappointed. Time, it seems, is standing still. I try to console myself by remembering that the pain is only temporary and will dissipate shortly after I hit the surface. So I wedge myself tighter beneath the rocky ceiling and suffer quietly. In spite of everything not once do I think, 'Why am I here' or 'Why am I doing this?' I take it for granted this is where I want to be. That this is what I love doing. That this is the price I am willing to pay. Finally 115 minutes tick by and I am free to go. Dizzy from the cold I emerge. I surface disappointed. The cave is sending me home tail in between my legs. The final restriction proved impenetrable. I spent a good 30 minutes at 45m, tanks off, trying to wriggle and wedge myself through. No matter how I approached the hole, what angle I took and what direction I came from, there was no way I was getting through. I felt like a 3-year-old child, left frustrated and confused as they desperately try to fit a circular ball into a square shape to no avail. Eventually, finally, I gave up. Not before the final fleeting thought - I should take the Nomad off too and try again. Luckily common sense prevailed. I stifled my curiosity. A wise move as it turned out. I had enough trouble getting my tanks back on as it was. After the adrenalin died down I realized that feeling and dexterity in my hands were all but gone. Agnes Milowka after her dive in Tigers Eye | Photo: Ken SmithThere don't seem to be enough adjectives in the dictionary to adequately describe what a couple of hours in 7 degree water feels like. The words 'frigid cold water' do not convey the full extent of the problem; the first invigorating moment the water hits your face, the slow numbing of the extremities that renders them useless, the constant shivering, the exhaustion you feel after the dive, the strength of will power needed to stay focused on the job and resist the urge to get the hell out of the water. Everything seems more difficult in cold water - everything is. After I came out of the restriction I fumbled and fought to get the tanks sorted out and return to a proper sidemount configuration. Finally, admitting defeat, I simply clipped them off to the d-ring and buttplate and got myself moving. I had already clocked up over an hour of deco - it was time to go. Thus ended my week of diving in the South Western part of Tasmania. Affectionately known as Tassie, the place is a little gem with unspoiled wilderness, spectacular scenery at every turn and some interesting cave diving yet to be done. The cave diving in Tassie is well famed for being tough and as such it doesn't really attract many cave divers from the mainland. It has all the good stuff; cold water, high flow, low visibility, difficult access to the water's edge and sharp rocks that have a habit of slicing through drysuits like butter. Undeterred I joined Grant Pearce, Dean Chamberlain, Liz Rogers and Ken Smith at Tiger's Eye as there was some unfinished business to be taken care of. In 2009, during the exploration of Lawrence Rivulet the team came across the hole in the middle of the woods and laid 95m of line. They ran out of time to continue exploration and now, a year later, we were back to discover more of its secrets. To get to the water's edge we had to bush bash. Tiger's Eye is surrounded by big trees and ferns, moss covered logs, spider webs and leeches. Beneath the canopy it is cool, dark and wet and the mosquitoes are unrelenting, thousands of them descend on any bare skin. Finally a slippery slope leads down to the bottom of the doline and there amidst the forest lies the beautiful azure blue surface of the hole. It looked terribly inviting from afar, but looks can be deceptive. The unusual blue tinge of the water actually meant reduced visibility, we were looking at diving in 2ft vis at best. Liz Rogers gearing up at Tigers Eye | Photo: Agnes MilowkaThe first few dives were in the majority spent cleaning up the line. After a hard winter and heavy rains tie offs had come loose and in a few places the line looked a bit fragile, hanging on by a mere thread. In fact Ken found himself in a spot of bother when the line broke in his hand after he descended down to 8m. He managed to control his beating heart and negotiate his way out without the aid of the line. Like a trooper he then proceeded to go back down to make the necessary repairs. The less then ideal conditions made it very difficult to find leads. It seemed the only option was to tie off the reel and strike out into the unknown. After negotiating the low flattener and popping through the tight vertical restriction it appeared I was in a larger room. The line followed the right wall, so I struck out to the left with the reel for what I hoped would be the other side of the chamber. Eventually I hit the opposite wall and found myself face to face with a little hole. I went in and enjoyed some Braille diving as the mound of silt rained down and the vis was reduced to zero. I thought I was making progress, things were looking up as the tunnel widened, then I saw the main line... I had found a little loop. While interesting, this was not the way forward. A handful more leads where found off the big chamber throughout the week, which, while providing temporary excitement, in the end didn't go anywhere. The second day I dived straight down to the end of the line. The cave simply stopped, as did the flow. Yet the flow had to be coming from somewhere. I looked around the end of the line to no avail. Then finally, as I started to head back I saw it - gaping darkness. I dropped my head in for a closer look and felt the ripping flow. Bingo! I dropped straight in through the fissure crack just big enough to squeeze through in sidemount and dropped straight into a booming phreatic passage. It felt perfect. I reeled out the length of the reel, 50m in one fell swoop and the cave was still going. On the way back I was kicking myself, I should have found this the day before. Easy to blame it on the visibility, but I should have known better. It was obvious something was going on around there, if only I had bothered to stop for long enough to take it all in and reflect. Guess better late than never. In the end Liz and Dean added another 30m of line, to a grand total of 80m, before the tunnel pinched down to a restriction. You could get into the restriction easily enough with sidemounts, but once through the way forward was blocked. Ahead the roof and ceiling came together and left a space perhaps half a foot high. To the left it looked slightly more promising, there was a chance that with a bit of effort it could go. What made it awkward was the 'tooth', a section of solid rock that struck out in the middle of the already small space. This in the end made the last restriction impassable, even without tanks on. I still hope that in the future I will squeeze my way through with a no mount rig on, but that remains to be seen. Grant Pearce and Agnes Milowka admiring For Your Eyes Only | Photo: Ken SmithFaced with a formidable foe at Tiger's Eye we needed a distraction and we decided to do a trip to Junee cave for a bit of variety. Junee cave is home to a very special place, a dry passage called 'For Your Eyes Only'. It requires a bit of muscle and wholehearted effort to get in there. First there is the walk from the car park to the entrance of the cave. Normally an easy, pleasant walk through the rainforest, it seems more like a death march once you start lugging gear. You then continue to carry the gear for another 100m up the streamway, fighting against the flow, which at any moment threatens to unbalance you. The cave is the main resurgence for the area and water gushes out from the entrance with great force, especially in winter. Finally, exhausted and sweaty you reach the first sump and submerge into the cold 7 dgree water. Compared to Tiger's Eye the vis at 6m was absolutely crackling... well, it was if you where the first one through. Despite the high flow there is an abundance of silt throughout the cave. 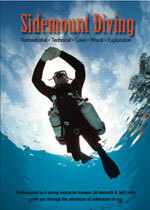 The dive itself is relatively short, in about 20 minutes you are through. But lets not take anything away from the dive, the cave itself is quite unique and beautiful with interesting rock formations. My favorite part of the dive though where the animals, the place is like a zoo. I have never seen such an abundance of cave critters in an Australian cave - I even caught a couple of them in the act. Once through the sump, you ditch the gear and prepare to be treated to one of the most incredible dry chambers. The large streamway passage is littered with some of the most incredible formations. The sheer volume of soda straws can easily take your breath away. The place is simply stunning. Visiting here alone made the whole trip to Tassie worth it. Simply walking through this breathtaking passage and enjoying its beauty, almost made me forget about the impenetrable restriction at a cave down the road... almost. Diving in Tassie is sensational but it comes at a price. You have to be willing to put in the hard yards, to work hard, to shiver and to suffer. In my mind it is worth it, every second of it. I am counting down to my return and I hope that I can rise up to the challenge of the eye of the tiger.